There has been a lot of discussion about Blue Light, not only within the optical industry but across the internet. Blue light is a high energy light that penetrates deep into the eye that has been shown to disrupt sleep patterns in children and adults. Doctors, teachers, scientists, digital device manufacturers, software engineers, and optical experts all are working towards reducing the harmful effects of blue light in our lives. Last holiday season we gave more tablets, e-readers, laptops, flat screen televisions, and mobile devices of all sorts, all adding more dangerous blue light into our daily routines. Add to that our ever increasing adoption of LED lighting within our homes and workplaces and you can soon see why people are worried. This is the time of year we spend the most time inside and online. It’s cold out and of course, the sun still sets quite early. That means we are even more dependent on these sources of artificial light that emit dangerous blue light. There are ways to help cut down on blue light exposure. There are computer programs you can add to your desktop and laptop machines that help cut blue light by following the sun such as f.lux. If you have an iPhone, iOS includes a program called Night Shift. There are a number of Android programs that can be added free of charge from the Google Play store that also can help reduce blue light. We can offer lens coatings that help cut down on blue light for eyeglass wearers. Stop into Bella Eyecare Optometry today and let us demonstrate the difference these coatings can make for you and your vision. 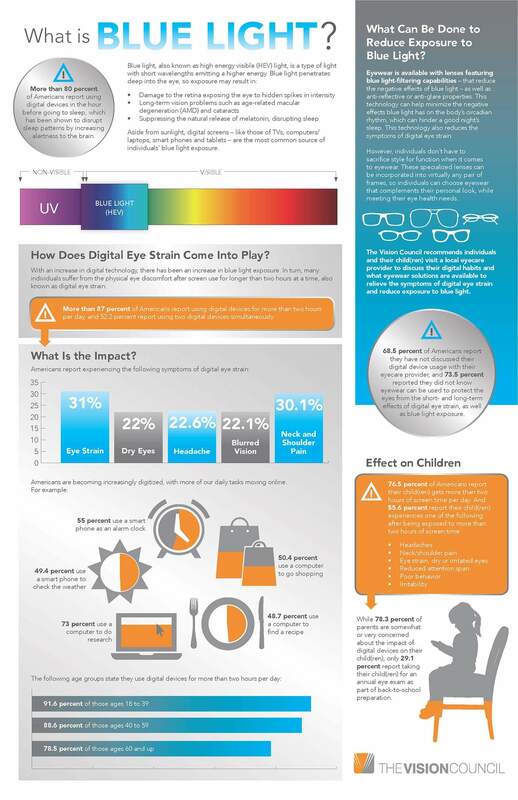 In the meantime, check out this infographic from our friends at The Vision Council demonstrating the dangers of blue light to you and me.